Ryman Hospitality Properties, Inc. (NYSE:RHP): Are Hedge Funds Right About This Stock? Legendary investors such as Leon Cooperman and Seth Klarman earn enormous amounts of money for themselves and their investors by doing in-depth research on small-cap stocks that big brokerage houses don’t publish. Small cap stocks -especially when they are screened well- can generate substantial outperformance versus a boring index fund. That’s why we analyze the activity of those elite funds in these small-cap stocks. In the following paragraphs, we analyze Ryman Hospitality Properties, Inc. (NYSE:RHP) from the perspective of those elite funds. Ryman Hospitality Properties, Inc. (NYSE:RHP) was in 24 hedge funds’ portfolios at the end of the third quarter of 2018. RHP investors should pay attention to an increase in support from the world’s most elite money managers lately, as there were 17 hedge funds in our database with RHP positions at the end of the previous quarter. In spite of this recent increase in enthusiasm from hedge funds, the number of those who followed it through the third quarter wasn’t enough for the stock to be considered as one of the 30 most popular stocks among hedge funds. In the financial world there are numerous formulas stock market investors can use to size up their stock investments. Some of the less known formulas are hedge fund and insider trading indicators. Our researchers have shown that, historically, those who follow the best picks of the best investment managers can outperform the broader indices by a significant amount (see the details here). 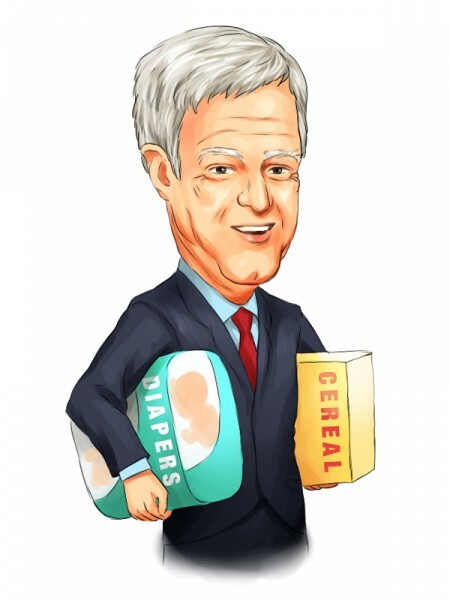 In a recent 3rd Quarter Shareholder Letter, Gabelli Value 25 Fund, managed by billionaire Mario Gabelli, shared its views and expectations on the company’s business. Let’s analyze the recent hedge fund action regarding Ryman Hospitality Properties, Inc. (NYSE:RHP). What have hedge funds been doing with Ryman Hospitality Properties, Inc. (NYSE:RHP)? At the end of the third quarter, a total of 24 of the hedge funds tracked by Insider Monkey held long positions in this stock, a change of 41% from one quarter earlier. 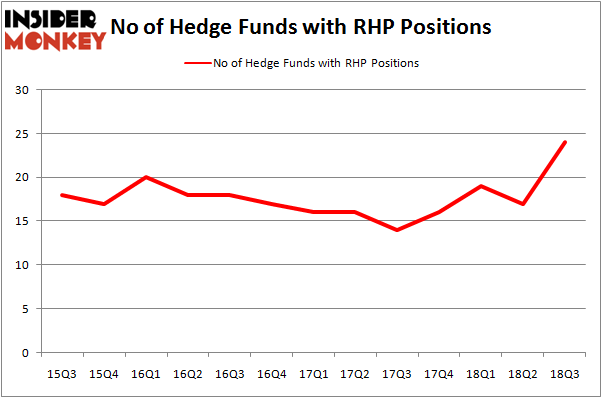 By comparison, 16 hedge funds held shares or bullish call options in RHP heading into this year. With the smart money’s sentiment swirling, there exists a few key hedge fund managers who were increasing their stakes substantially (or already accumulated large positions). The largest stake in Ryman Hospitality Properties, Inc. (NYSE:RHP) was held by GAMCO Investors, which reported holding $256 million worth of stock at the end of September. It was followed by Millennium Management with a $72.6 million position. Other investors bullish on the company included Water Street Capital, Renaissance Technologies, and GLG Partners. With a general bullishness amongst the heavyweights, specific money managers were leading the bulls’ herd. Impax Asset Management, managed by Ian Simm, created the largest position in Ryman Hospitality Properties, Inc. (NYSE:RHP). Impax Asset Management had $17 million invested in the company at the end of the quarter. Charles Davidson and Joseph Jacobs’s Wexford Capital also made a $4.9 million investment in the stock during the quarter. The other funds with brand new RHP positions are Paul Marshall and Ian Wace’s Marshall Wace LLP, Sara Nainzadeh’s Centenus Global Management, and Dmitry Balyasny’s Balyasny Asset Management. Let’s now take a look at hedge fund activity in other stocks similar to Ryman Hospitality Properties, Inc. (NYSE:RHP). These stocks are Schneider National, Inc. (NYSE:SNDR), Gramercy Property Trust Inc (NYSE:GPT), Radian Group Inc (NYSE:RDN), and Thor Industries, Inc. (NYSE:THO). This group of stocks’ market values resemble RHP’s market value. As you can see these stocks had an average of 23 hedge funds with bullish positions and the average amount invested in these stocks was $391 million. That figure was $605 million in RHP’s case. Thor Industries, Inc. (NYSE:THO) is the most popular stock in this table. On the other hand Schneider National, Inc. (NYSE:SNDR) is the least popular one with only 19 bullish hedge fund positions. Ryman Hospitality Properties, Inc. (NYSE:RHP) is not the most popular stock in this group but hedge fund interest is still above average. This is a slightly positive signal but we’d rather spend our time researching stocks that hedge funds are piling on. In this regard THO might be a better candidate to consider a long position.